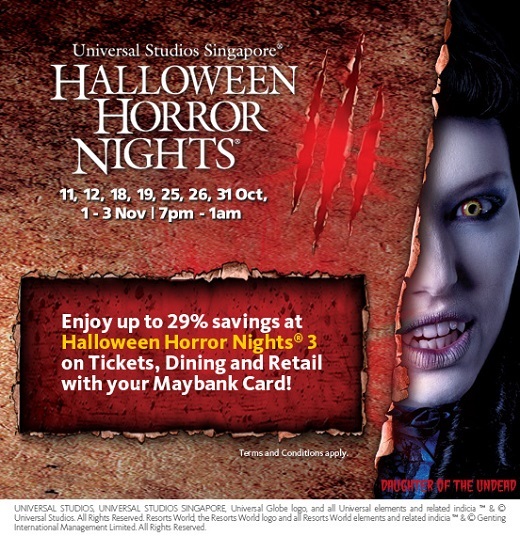 Maybank Singapore is proud to be the official card for the third consecutive year for the region’s most terrifying and highly anticipated event of the year – Halloween Horror Nights 3 @ Universal Studios Singapore. From now till 3 Nov 2013, charge to your Maybank Credit or Debit Card and enjoy exclusive ticket prices and discounts on food and merchandise! Test your nerves in a terrifying maze of haunted houses and scare zones – but beware – three vengeful sisters have forged an evil alliance to trap unsuspecting victims. Confront your deepest fears and face the three evil sisters at Halloween Horror Nights 3! ^ Regular tickets promotion is valid for purchases made from 5 Sept to 3 Nov 2013. ** Limited to one lanyard per Cardmember for the first 100 Maybank Cardmembers per night during Halloween Horror Nights 3. # Lanyards can only be redeemed at the Universal Studios Store inside Universal Studios Singapore. Please show your tickets and the Maybank Card that was used to purchase regular tickets. † Valid only during Halloween Horror Nights 3. * Valid only for Halloween Horror Nights 3 event. Limited to first 400 redemptions. Valid for online purchases only from 5 Sept to 3 Nov 2013. Limited for purchase up to 3 redemptions per Cardmember. Payment must be made with a Maybank eVibes or Platinum Visa Card.